Host an Ugly Sweater Party! This entry was posted on November 20, 2018 by Jessica Anderson. Looking to add some fun and hype to your next holiday celebration? Host an Ugly Sweater Party! What is an Ugly Sweater Party, you ask? Well you know that hideous reindeer sweater that Colin Firth's character wore in Bridget Jones Diary? Yep, that's the perfect example of an Ugly Christmas Sweater, as seen in the movie clip here. Every year at our Trophies2Go Holiday Party, we wear ugly sweaters, and there are always some doozies. And by doozie, I mean absolutely awful and extremely hilarious. Thrift Store. Pop some tags at your neighborhood Value Village and then after washing in HOT, spruce up your one-of-a-kind find with lights and bows. Amazon. Check out Amazon's lovely (?) collection of Ugly Sweaters. These are a little more on the edgy side, PG-13 parties only! I think my favorite is the Sasquatch in a Bikini. Target. Cute, cheap and trendy, Target has a fun collection of darling holiday sweaters. Not as much ugly as cutsie, in my humble opinion. Pinterest. It's my go-to place for clever ideas, including how to make your own Ugly Christmas Sweaters! I found this link to 20 Christmas Sweaters that are not just ugly but wrong (and R-rated). Might not be appropriate for the office party, but will definitely generate some laughs with non-offended friends and family! Relative's Closet. Got a hoarder in the family? Rummage the back of their closet for a vintage find!!! 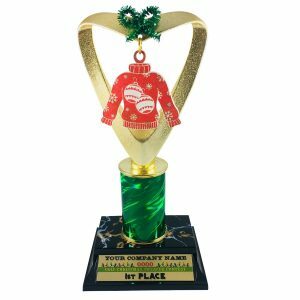 Our Ugly Sweater Trophy even includes an ornament you can add to the Christmas Tree! Fun Tip: Well you CAN knit a sweater for an existing trophy on your shelf, or you can have us do the work for you! Check out our Ugly Sweater Awards! Ugly Sweater Holiday Trophy - Handmade by our graphic designer Lori N, these darling trophies feature an Ugly Sweater Ornament, either in Green Gingerbread or Red Ornaments. The base features the name of the party, organization and date all in full color to match the trophy! Our Best Seller on Amazon! Ugly Sweater Holiday Metal - in Gold, Silver and Bronze for your 1st, 2nd, & 3rd place finishers. Full Color Christmas Plaque in a range of sizes and colors, completely customizable to your event! You can even add a logo for FREE! Learn more about the Brief History of the Ugly Christmas Sweater by Time Magazine here. Awards bring hype to any competition, even a silly one such as an Ugly Sweater Party! And all of our Christmas Awards and Gifts include FREE personalization! Wishing you a wonderful holiday season, full of laughter and fun, celebrating with those you love! Happy Holidays! Editor's Note: This post was originally published November 2016, It has been updated for content.